An info session about the StreetARToronto grant program and a discussion on innovation and community engagement in public art. April 19 from 4pm-6pm at Art Starts. Directions: Yorkdale Mall is located at the Yorkdale Subway Station. Art Starts’ Yorkdale Community Arts Centre is located in the Lower Level of the Yorkdale Mall. Access the Lower Level via the elevators beside the Home Outfitters escalator. Exit into what looks like an underground parking garage, go through a set of double doors and voila! Wondering what’s happening with Toronto’s new graffiti management plan and the Graffiti Transformation Project? Do you want to learn more about funding available from the new StreeetARToronto (StART) grant program? Are you interested in shaping the future of city-supported community murals and street art in Toronto? 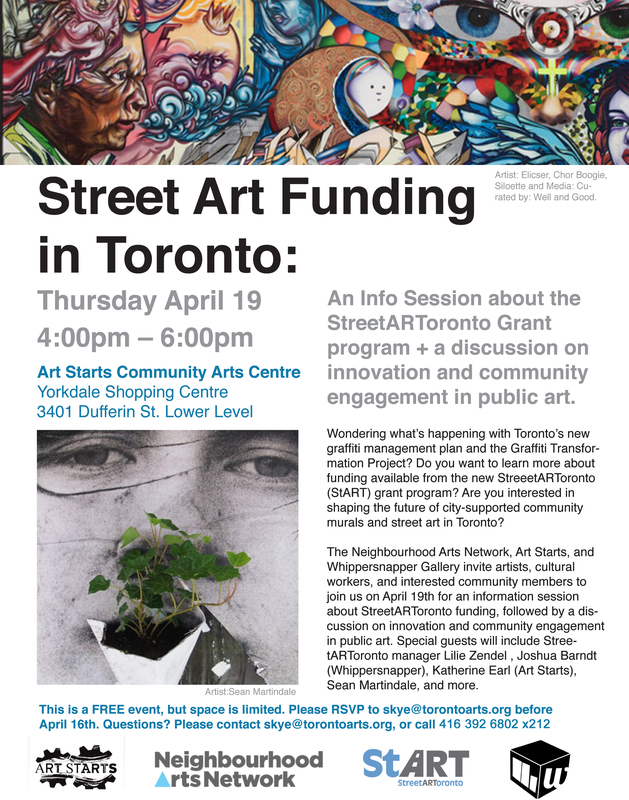 The Neighbourhood Arts Network, Art Starts, and Whippersnapper Gallery invite artists, cultural workers, and interested community members to join us on April 19th for an information session about StreetARToronto funding, followed by a discussion on innovation and community engagement in public art. Special guests will include StreetARToronto manager Lilie Zendel , Joshua Barndt (Whippersnapper), Katherine Earl (Art Starts), Sean Martindale, and more. This entry was posted in Events, Funding, Ideas, Info Sessions, Infrastructure, Networking, News and tagged Art Starts, Graffiti Transformation Project, Katherine Earl, Neighbourhood Arts Network, Sean Martindale, StARToronto, Street Art Toronto Funding, Whippersnapper by Neighbourhood Arts Network. Bookmark the permalink.